Where did it come from? As resistant as I am to paying for e-books, I caved and downloaded the bundle of the first three books in the series. It was on sale for $10! I’m weak. Why do I have it? I feel like I’ve been hearing about these books from everywhere since they came out, so I can’t pinpoint one person for blame with certainty. Possibly Memory’s fault? How long has it been on my TBR pile? Since 13 September 2011. 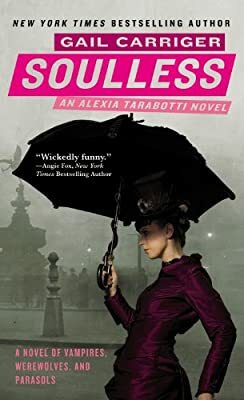 Summary: Alexia Tarabotti is willful, headstrong, half-Italian, and a spinster, but most damningly, she’s a preternatural. Unlike the supernaturals – vampires, werewolves, and ghosts, all of whom have an excess of soul – Alexia doesn’t have a soul at all, which means she is able to counteract supernatural powers with a touch. Her soulless nature is not exactly something she advertises, though, so when she accidentally kills a vampire in the library at a party, there’s the potential for a huge scandal. Lord Maccon, the Scottish Alpha of the London werewolf pack and head of the Bureau of Unnatural Registry, helps keep Alexia’s name out of the papers, but he’s got other things on his mind than just her reputation. Newborn vampires have been appearing with no knowledge of custom or protocol, and lone werewolves have been disappearing. Alexia is determined to help Lord Maccon get to the bottom of the mystery… if only he weren’t so distractingly handsome. Review: I’m sorry I waited so long to start this series, because I just had oodles of fun with this book. I enjoyed pretty much everything about it; it’s a great blend of fantasy and romance and Victoriana and just a touch of steampunk, and the best part is that it doesn’t take itself too seriously. The whole thing is infused with a sly sense of humor that winks out at the reader from every page, so that even the overblown Victorian-esque prose feels fresh, and like it’s in on the joke. Alexia decided, then and there, that Lord Conall Maccon clearly had only two modes of operation: annoyed and aroused. She wondered which one she would prefer to deal with on a regular basis. Her body joined in that discussion without shame, and she actually managed to shock herself into continued silence. I honestly can’t think of a better descriptor for this book than “fun.” I was giggling almost constantly; the leads both have a wonderful snarky sense of humor, and Carriger’s clever twists on Victorian standards managed to be homage and send-up both. I loved that the romance-y parts managed to feel steamy without getting too anachronistically smutty; they mostly involve some pretty tame necking (although since it involves a werewolf rather than a vampire, perhaps “heavy petting” might be a more apt turn of phrase?). There were a few points that I didn’t love as much. The narration is third-person omniscient, and the POV skips between characters from paragraph to paragraph. I understand the stylistic reasons for this choice, and I got used to it eventually, but I did find it rather distracting in parts. I also saw the solution to the mystery coming from a mile away, and thought that it could have been made a bit more detailed and complex. But really, on the whole I was having way too much fun with the rest of the story to mind much. 4 out of 5 stars. Recommendation: Fun stuff. Recommended for readers who like historical romance and/or urban fantasy, and are in the mood for something light-hearted and giggle-inducing. Other Reviews: They are all over the internet. Check them out at the Book Blog Search Engine. First Line: Miss Alexia Tarabotti was not enjoying her evening. Location 101: “All its many layers of green trim, picked to the height of fashion in lightening shades to complement the cuirasse bodice, were being crushed into oblivion under her weight.” – Also called corselet; defensive armor for the torso comprising a breastplate and backplate, originally made of leather. © 2011 Fyrefly’s Book Blog. All Rights Reserved. If you’re reading this on a site other than Fyrefly’s Book Blog or its RSS feed, be aware that this post has been stolen and is being used without permission. I’ve read the first three in this series, and the first one is definitely my favorite! Such fun! Jen – I’ve finished all three now, and I think the first one is my favorite also, although it’s close. I adore the covers of this series, but I just can’t convince myself it’s for me. Kathy – I have to say, I don’t think these books are going to be up your alley. But very stylish covers, it’s true! I’ve never heard of the series but this sounds like so much fun. I love urban fantasy with a sense of humor. Amy – Oh, definitely check these out, then! I really love this series too, and you are right, it is tons of fun! I can’t wait to get my hands on the next book. Trisha – Have you read all 4? My favorite part in this book is the very beginning. She does have a good use of language. Fun vocab words! Chris – I like how she picked words that had real, relevant meanings but were still unfamiliar enough to become her made-up terms, instead of just making up new words out of whole cloth. I’ve yet to read this one, but I’ve got it close to hand…sounds like…yup, fun! BiP – If you’re anything like me, I’d make sure you also have the sequels nearby before you start, because one just wasn’t enough! I’m so conflicted as to whether or not I should try this series! I really hate the covers. I can’t explain why, but I hate them. I also don’t like urban fantasy — fantasy yes, urban no. I’m not big on werewolves or heavy romance, but I like steampunk and Victorian fiction as well as snarky books that don’t take themselves too seriously. I might, eventually, just have to try one and see! I’m glad you enjoyed this one. It really does sound fun! And I’m ambivalent about the covers. I like the figures and the artwork well enough, but the hot-pink-skewed-shape-stark-font of the titles is pretty off-putting, and doesn’t really match the feel of the books, in my opinion. As for the covers, I don’t like the font, either — I do think it’s off-putting, and what’s the point if it doesn’t reflect the book? There’s also something unnatural to me about the figure’s posture. It freaks me out! I really enjoy this series! I am reading the third book right now. I think the first book remains my favourite, but they are all a lot of fun! Kailana – I just finished the third book yesterday. So much fun! I really enjoyed this one too! Even more after I let some time pass and thought about it some more. Then I went and got the next books as they were published, but I am keeping them for when my mood needs a little lift. Emily – I was trying to describe these books to my dad, and as I’m running through the worldbuilding and everything, he’s looking more and more skeptical… I couldn’t explain that sometimes you just need a good, silly, giggle-inducing book! I absolutely adore this series. It has its faults, but the humor, puns, and light-hearted mocking of the Victorian era makes up for all of them. I devour these books because they are so fun, and I love to see new fans! Michelle – I resisted reading them for a long time… I’m not sure why, exactly, but now I’m totally hooked. omg! i definetly have ti read this series! it’s in the vitorian era and it has romance this is my type of book!